Red wine is definitely a weakness of mine, how about you? I'm guilty of having at least a dozen bottles available at all times. You can celebrate all month long by getting horror themed wine this October! Here are some options. The skull illustration on this Jawbreaker California Cabernet Sauvignon red wine is so awesome! It's a little creepy, but mostly the colors are really cool. 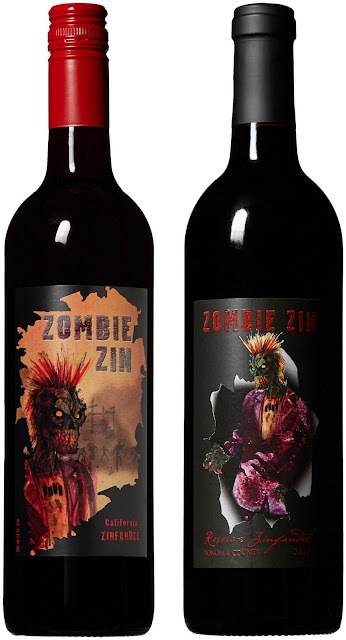 This Zombie Zin California Zinfandel red wine is perfect for a zombie Halloween movie night. You could even have this for a Walking Dead night with some close friends! Better yet, make it a two bottle night with the Zombie Apocalypse Non-Vintage California red wine mixed pack. This is quite a sinister bottle! The Twisted Oak "River of Skulls" Mourvedre would be perfect for any creepy Halloween party. Twisted Oak is one of my favorite brands too! It would be great to serve this Bewitched Russian River Valley Pinot Noir at a magical event. Invite your closest girlfriends for your next witchy gathering. Just like a little coven. Careful when opening this bottle of Curious Beasts California Red Blend! You never know what curious beast you might become. Is it a werewolf? Vampire? Monster of Frankenstein? Let's find out! What do you think of these horror themed wines? I think it's a great idea for the whole month of October. Plus, they all sound incredibly tasty! Make sure to comment below and let me know of any other Halloween wines.